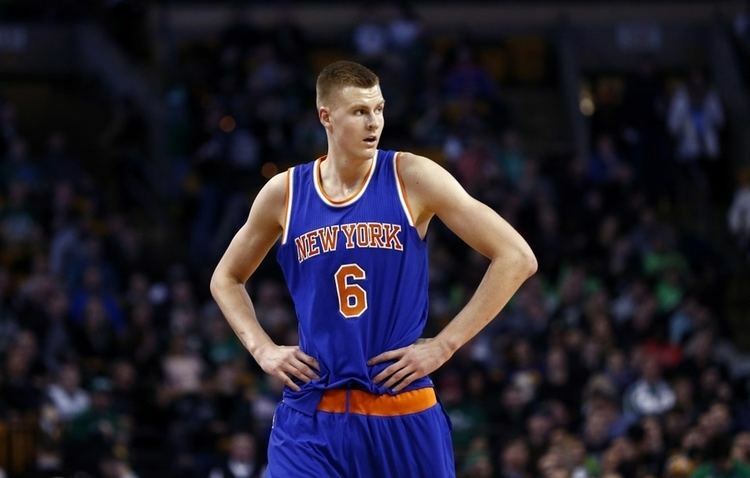 Kristaps Porziņģis is a Latvian professional basketball player plying his trade with the New York Knicks. The lad was such a highly sought after talent in his first draft season. He was notably towering above many others before him in the sports, with raw talents seeking to be further developed for exploits on the court. On his supposedly first drafting attempt, a mild drama occurred which saw Kristaps not being drafted in that year. Find out all about it here, including his biography, career progression, injury stats and every other thing we have found to be of interest pertaining to this Latvian B-baller. Porziņģis has as his siblings; Mārtiņš (younger brother) and Jānis his elder brother who equally took up the family’s sports tradition by playing basketball and now works as his brother’s (Kristaps Porziņģis) agent. Growing up, Porziņģis began practising his innate abilities in playing basketball as early as 6 years old. His brother who was already playing in Europe then would often take him to offseason training just after he turned 12. The kid then began playing for BK Liepājas Lauvas up until he was 15 at which point he joined Baloncesto Sevilla, a Spanish based team. He didn’t make his debut for the Spanish side until 2012 due to language and health (anaemia) challenges he had which all culminated into him not fitting properly into his new team. However, Kristaps made remarkable improvements in the course of time and was soon slogging it out with his teammates in training and with opponents in competitive matches. Kristaps Porziņģis began his professional career in the 2012/2013 season, playing in the youth team of Baloncesto Sevilla which was competing in Liga ACB/Liga Endesa. The lad improved immensely with every game and got a call-up to the first team. He scored his first point on 20th February 2013 against Spartak and that was simply the beginning of great things to come. The Lativan basketballer announced his intentions to be eligible for the National Basketball Association draft on 28th April 2014 and there was a ready interest from Oklahoma City Thunder who sent a scout to Europe just because of him. There were high hopes that Kristaps Porziņģis was already bound for the Sooner State but just a day before the draft, the unexpected but highly possible happened. Kristaps withdrew his name from being eligible in the draft with his then agent citing that he felt he needed a lot more time to develop his game. To this, he received commendations from one of the leagues general managers who stated that he was a big talent and would certainly enter the draft as a better player. In the course of time, the 2015 NBA Draft came calling and Kristaps Porziņģis was drafted as the 4th overall pick as selected by the New York Knicks which made him the highest ever drafted Latvian and Baltic player in the history of the NBA. He has been with the team since then, improving his game in every season. Kristaps Porziņģis has played over 186 games since he joined the NBA, this has seen him record an average of 17.8 points per game with a field goal percentage of 43.7, a 3-point field goal percentage of 36.1, 7.1 rebounds per game with 1.3 assists, 0.7 steals and 2.0 block per game. The baller earns a base salary of over $5 million which extends to 2018 and 2019. This comes courtesy of his four-year $18 million contract with the New York Knicks which is fully guaranteed. What is His Injury Stats? In a sport like Basketball, injuries are often a normal occurrence though at varying degrees and in different circumstances. The more serious ones can lead to a player not seeing any NBA action for a considerable length of time in the course of which some might become blunt and find it hard picking up form when they are back on the court, ultimately ushering in the wane of their career. It is for this reason that players try as much as possible to avoid getting injured but when they do get one, it is a thing of worry to not only them and their team managers but to we the fans as well. Kristaps Porziņģis, according to some reports, is feared to likely miss the whole of the 2018 NBA season due to a knee injury he picked up in a 103–89 loss to the Milwaukee Bucks on February 6, 2018. He tore his ACL in the match just three minutes into the 2nd quarter when he landed on the foot of Giannis Antetokounmpo after making a dunk. For an injury such as this, the basketball player will have to be out for at least 10 months after undergoing surgery to fix his knee. Other than his rumoured relationship with actress and model – Abigail Ratchford, Porzingis has not been known to be dating or dated anyone in the past, at least not one that is publicly known. We can fairly say that he is fully committed and devoted to his Basketball career and perhaps, being too involved with women at this point might dissuade him. Basketball is no doubt a sport where height is of immense advantage, to this, Kristaps Porziņģis is not found lacking as he towers above many standing at 7 feet 3 inches or 2.21 m. At this height, he weighs in about 240 lbs or 109 kg.